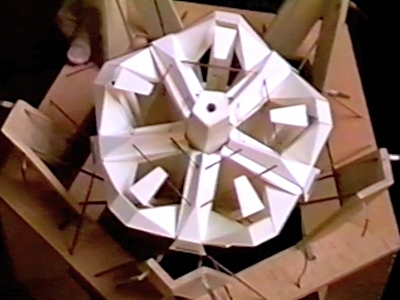 Bionic model of Aristotle's lantern. This model of the mouth of a sea urchin was built by Scarpa in the 1970s. It's composed of paper board (bristol), glue, and pure rubber elastics. 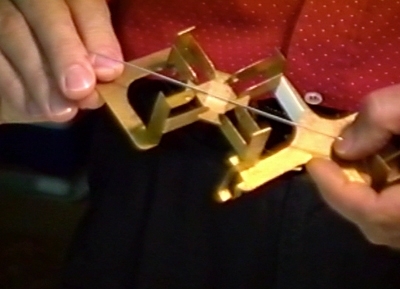 The frame representing the attachment points of the muscles (the elastics) is made of wood. You can see a video of the mechanism and the functioning of the model by going to the URL shown at right. In 1985, a book about this model was published by Scarpa: "Modelli di bionica. Capire la natura attraverso i modelli" Zanichelli. (Bionic Models: Understanding Nature Through the Use of Models). The book was part of a series edited by Bruno Munari and entitled "Quaderni di design" (Design Notebooks). This model composed of 12 elements collapses into a minimum cubic volume. This model and similar ones are the subject of Scarpa's first book: "Modelli di geometria rotatoria. I moduli complementari e le sue combinazioni", Zanichelli, 1978. (Models of Rotational Geometry: The complementary Modules and Their Combinations). 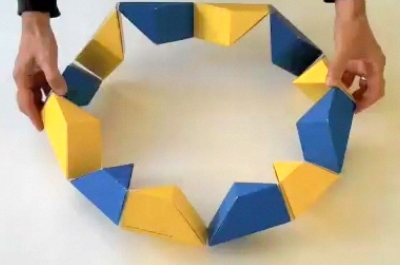 Although at first the bionics book and the rotational geometry book might appear unrelated, they are in fact part of the same quest by Scarpa to find patterns and connections between nature and geometry. A video and more info at the URL at right. DNA model. This model of DNA lies flat when not in use. 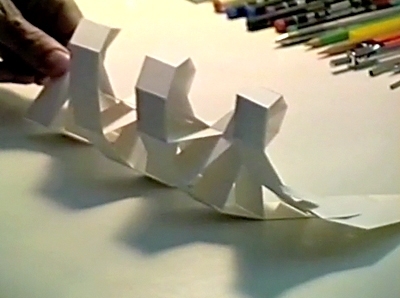 The models shapes itself into the familiar double helix by applying a rotation at one end of the chain. A video of the model can be seen at the URL at right. Muscle model. Detail of a model that simulates the rotation and shortening of a muscular fiber. A video of this models can be seen at the URL at right. Giorgio Scarpa (1938-2012) taught Descriptive Geometry for 40 years at the Art Institutes of Oristano and Faenza, Italy. He also taught Theory of Perception for 28 years at the Institute of Design (ISIA) in Faenza. His books on Bionics (Aristotle's Lantern) and Rotational Geometry, were published in Italy as part of a design series edited by the late Bruno Munari. Scarpa's (mostly unpublished) explorations include bionics, topology, DNA and muscle structure models, at times attacking such abstract problems as defining rules on how to find one's way out of a labyrinth. Videos and PDFs about his work can be viewed at the URL on the right.